The Total Cost of Ownership Analysis, or TCO, seeks to measure all of the expenses, both human and technical, behind a given technology. This type of analysis shows that the costs to build and operate a successful online workplace for team members to collaborate, communicate and conduct business encompasses much more than just the cost of software and hardware. TCO includes all costs related to the technology lifecycle including research, procurement, deployment, maintenance and support. Thinking in terms of TCO helps organizations improve their understanding and their management of the budgeted, unbudgeted, direct, and indirect costs incurred in acquiring, maintaining, and using a technology. **The costs associated with ensuring data integrity – backup, virus and spam control- grows with the size of the organization. In order to paint the most conservative picture we have used the lower end of the cost range. With the model various called the outsourced, hosted or software-as-a-service model; the organization uses a single vendor to offer the entire operational solution. HyperOffice offers a fully integrated collaboration, communication and intranet solution set aimed specifically at improving the operations of growing businesses. HyperOffice provides a single point of accountability across all of the components mentioned in the in-house model and covers all of the critical success drivers that support a successful initiative. The pricing for HyperOffice is all-inclusive and accounts for achieving a true TCO. 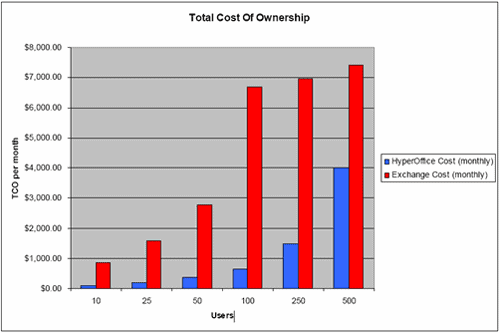 Following is a comparison of the total monthly cost of ownership for HyperOffice VS MS Outlook/Exchange. The HyperOffice cost does not reflect a one time upfront setup cost of $39.99 and an optional one time customization and branding cost of $60.00. This cost may be avoided if the organization does not choose to have a custom domain name but it is prudent to assume that most organizations would incur this cost. HyperOffice’s integrated solution covers all of the components required to launch and maintain a successful collaboration, communication and intranet solution. HyperOffice also provides the added benefit of being priced in a way that makes all associated cost visible and ties them directly to the number of team members using the system to improve their productivity. There is no risk of overspending and not realizing a reasonable rate of return or running the risk of underspending and hindering the growth and productivity of the organization. With HyperOffice, predictable costs are only incurred as team members use the system and can be scaled back if necessary to reduce financial risk. The transparent nature of HyperOffice’s pay-as-you-grow model allows organizations to avoid high start-up costs and high ongoing-use-costs while eliminating unforeseen surprises that are so often the ruin of sound financial management strategies. In the TCO analysis, the in-house model starts with a relatively large upfront investment and continues to incur unpredictable ongoing maintenance and support costs. Some of these can be easily identified and managed and some of them are unexpected and unforeseen. With no upfront investment and low, predictable per user costs, the HyperOffice outsourced solution typically provides a much shorter payback period, a less risky path to growth and faster positive return on investment.